Centro Cristiano Vida Nueva is a Hispanic church based in downtown Phoenix Arizona. Fusion Web provided a completely customized WordPress theme with support for photos and videos. 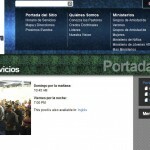 Also provided to CCVN was the ability to stream their church services live over the internet using uStream.